Welcome to the very first issue of The Linen & Lace magazine. We have been so excited to bring you plenty of inspiration and show you how you can use our deep dish dies in your quilting and sewing projects. With issue one, we have included the set of three 60° triangles – variable dies that can be used for so many different patterns. We have a fantastic range of projects that show you how to use this triangle shape, as well as how you can use additional dies from our Linen & Lace range. 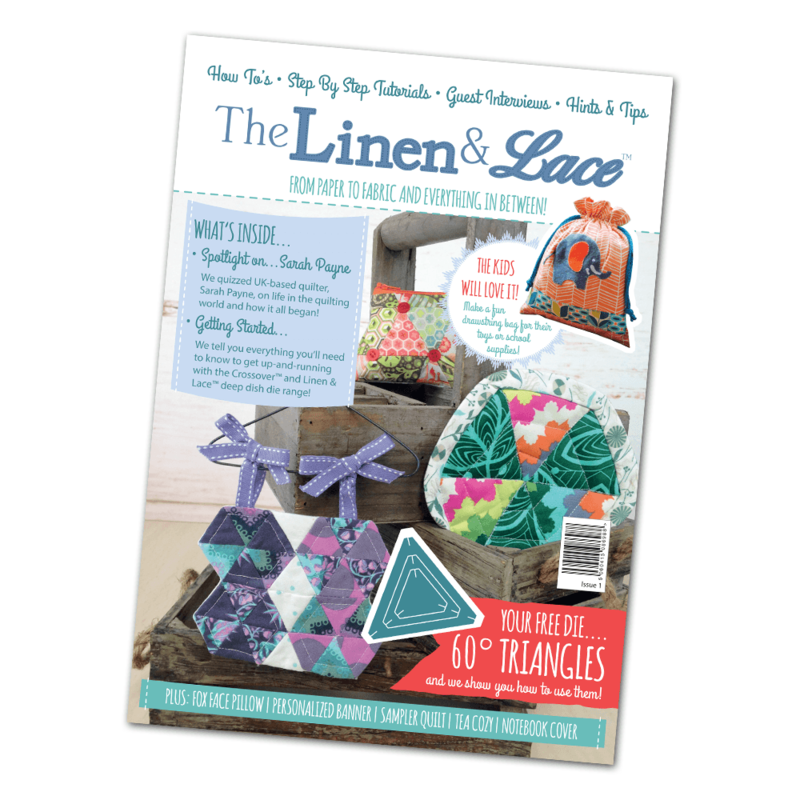 This magazine is perfect for crafters of any skill level, whether you have been quilting for years or it’s the first time you’ve picked up a needle! We’ve gone back to basics with an introduction to quilting and details on how to use our Crossover machine for sewing projects. We have a guest appearance from quilter, Sarah Payne, and over 14 projects too. Handmade projects have become more popular than ever as they allow you to enjoy a new hobby with a wonderful finished product at the end, which can often be made more cost effectively than buying something from a shop. There is also a real personal touch to making something as a gift and can be made using your choice of pattern and colour to be entirely personalised. It gives you the chance to be completely creative and tailor make items that are in keeping with your home décor, favourite colours and more. Any of the projects in this magazine can be adapted to suit your style and used as inspiration to take projects one step further. We hope you enjoy our first issue and would love to see you all again for issue two.